Roundstone Music and Crafts lies within the walls of an old Franciscan monastery in Roundstone in the heart of Connemara, County Galway. 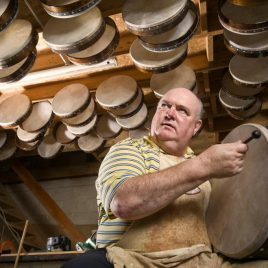 Master craftsman, Malachy Kearns, creates his famous bodhráns in-store. Roundstone Music and Crafts is a fine craftman’s craft shop that also sells music, fashion and has an adjacent coffee shop. Regular talks and demonstrations are given on the bodhrán. A large private car-park is provided for visitors.